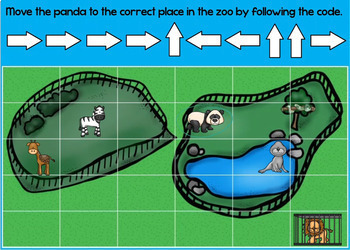 An interactive and fun way for young students to practice and learn the basics of computer coding and programming. Students move an animal to the correct place in the zoo by following the code then click the Submit button to see if they are correct. This helps students learn the importance of following each step of code in the correct sequence in order to get the the desired response and why sequence matters in a computer program. 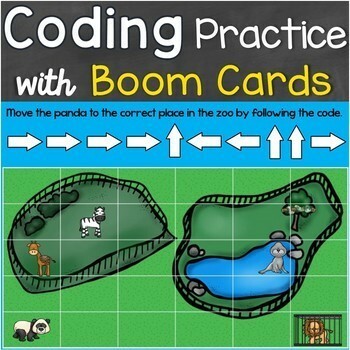 This digital Boom Card resource provides the practice students need to get comfortable with coding so they can go on to master more challenging activities. Practicing coding also improves sequencing skills, problem-solving, logical thinking, cause and effect skills, and computational thinking. The cards are self-checking so young students can work independently. This deck includes 20 unique cards that play in random order so each play of the deck is different. Each card has both audio and written instructions. Perfect for hour of code, STEM / STEAM instruction, computer programming class, or center time. Use on your interactive whiteboard, iPads, desktop, tablet, smartphone or with Google classroom. Boom Cards are interactive, self-checking digital task cards that require NO PREP (no printing, cutting, or laminating required)! They offer an easy way for teachers to assess important skills and a fun way for students to practice these skills. They are perfect for whole group instruction on an interactive whiteboard or small group instruction, center activities, individual practice on an iPad, laptop, desktop, tablet, or smartphone. New to Boom? Boom Cards live in the cloud. They can't be printed. They play on most modern browsers, Android, iPads, iPhones, and Kindle Fires. When you redeem your purchase, you open a Boom Learning account to play the cards (they are played on Boom to protect the children). You create Fast Play pins to assign your Boom Cards to students. Boom Learning also has premium accounts. Premium accounts offer advanced assignment tools, individual and whole class performance tracking, and more. If you are a new Boom Learning customer, when you redeem your Boom Cards purchase you get a 90-day free trial of a premium account. When your trial ends, you can renew or move to a free account. You may upgrade, downgrade or cancel at any time. Free accounts use purchased Boom Cards with Fast Play pins. If you do not subscribe at the end of your trial, you will be able to continue using Boom Cards with the Fast Play feature. Fast Play does not track individual progress. 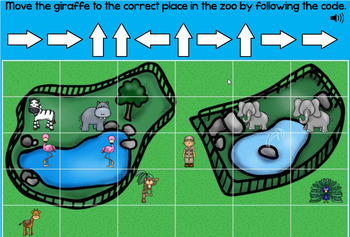 Boom Cards play on modern browsers (released in the last three years) on interactive whiteboards, computers and tablets. Boom Cards apps are also available. Not sure if your browser is modern enough? Try a free Boom Cards deck first. • CLICK HERE to become a follower. You will now receive email updates about this store.